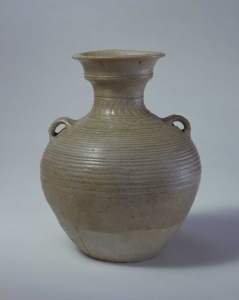 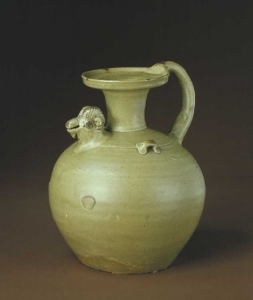 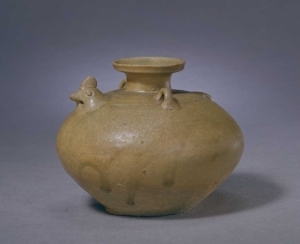 The first pottery to survive in appreciable quantities belongs to the Han Dynasty (202 B.C. 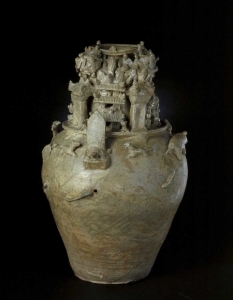 – A.D. 220); most of it has been excavated from graves. 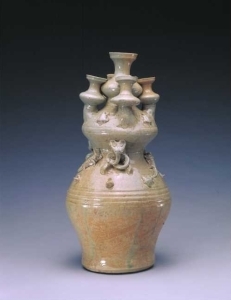 Perhaps the most common form is the hu (壺), a baluster-shaped vase copied from bronze vessels of the same name and sometimes decorated with relief ornament in friezes taken directly from a bronze original. 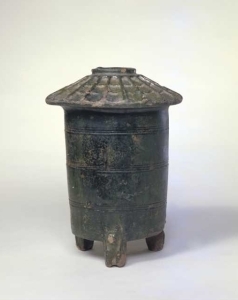 The hill jar (罐) is another fairly frequent form, and many models of servants, domestic animals, buildings, wellheads, dovecotes, and the like also have been discovered in graves. 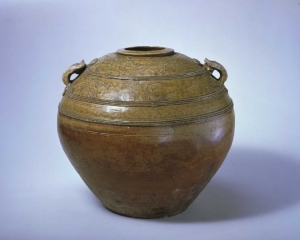 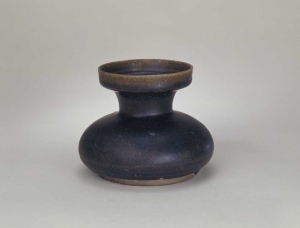 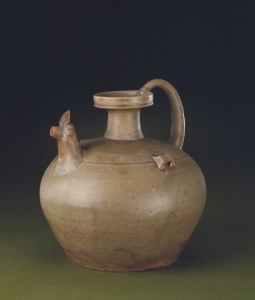 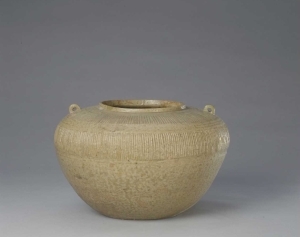 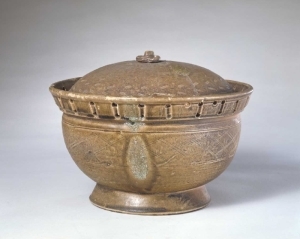 During the Han dynasty, two types of glazed ceramics appeared – low-fired pottery and high-fired porcelain. 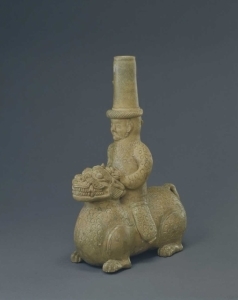 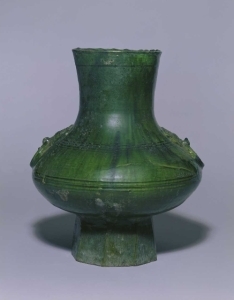 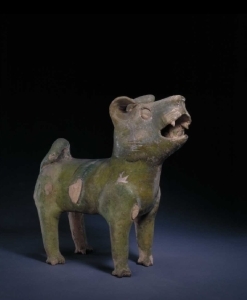 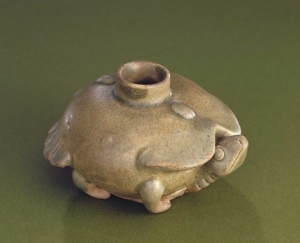 Northern China saw the invention, presumably for funerary purposes only, of a low-fired lead glaze, tinted brown or green. 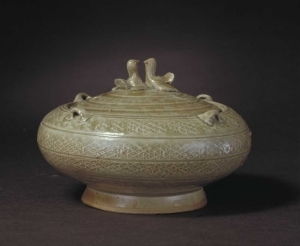 Towards the end of the Han, high-fired porcelain with a thin olive or brownish green glaze was invented in northern Zhejiang region, formerly known as Yuezhou. 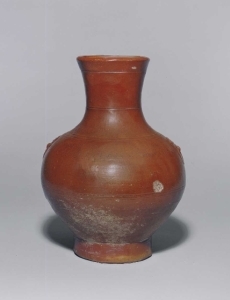 The kilns became known as Yue kilns (Yueyao, 越窯). 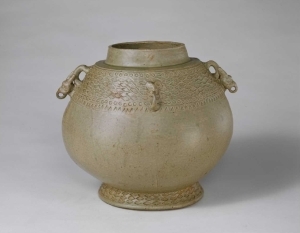 Yueyao wares belong to the family of celadons (qingci, 青瓷, “green porcelain”), a term that looms large in any discussion of early Chinese ceramics. 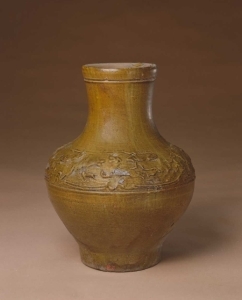 It is applied to glazes ranging from the olive of Yue to the deep green of later varieties. 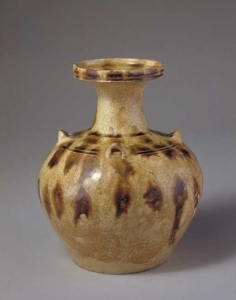 These colors were the result of a wash of slip containing a high proportion of iron that was put over the body before glazing. 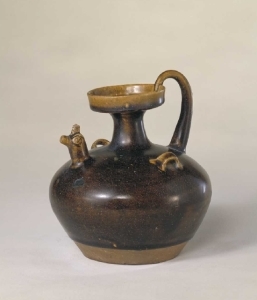 The iron interacted with the glaze during firing and colored it. 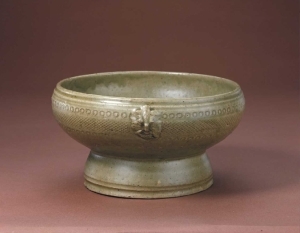 The Han Empire was followed by four centuries of political disunity — often termed the Six Dynasties period (220 – 589), which include the Three Kingdoms, the Jin Dynasty, the Southern and Northern Dynasties. 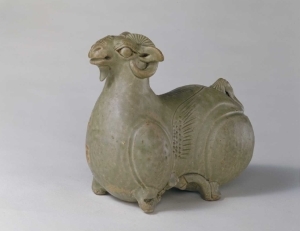 This was the era when Buddhism began its ascendancy and the economy of the Yangtze River Valley caught up with that of the Yellow River Valley to the north. 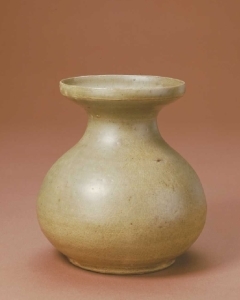 Celadon glazed porcelain began to occupy an ever-increasing role in daily life, Buddhist rituals, and burials.